The first feudal wooden motte, sheltered by high hills and perched on a rocky outcrop surrounded by marshes was built on this site in the 11th century. The superb position of this structure ensured that Fougères could defend the crossroads between Maine, Anjou, Normandy and Brittany. In 1066 The Lord of Fougères took part in the conquest of England in support of William of Normandy. In the year 1166 King Henry II Plantagenet laid siege to the wooden castle and burnt it down. A new castle was built on the site by Baron Raoul II and completed before the end of the century - this time the construction was of stone. During the 13th century a great many improvements were made to the fortress after the sole heiress to the Lords of Fougères Jeanne de Fougères married Hugues XII de Lusignan. After this joyous event, the powerful and wealthy Lusignan family who come from Poitou continued to improve the castle adding ramparts around the town with four gateways at the four points of the compass. The Lusignan family also brought the legend of Melusine to the castle. In 1373, Bertrand du Guesclin (drawing right) seized the town and the castle and Barony of Fougères became the property of the Seigneur d'Alençon. Bertrand du Guesclin (c. 1320 - 13 July 1380), also known as the Eagle of Brittany or the Black Dog of Brocéliande, was a Breton knight and French military commander during the Hundred Years' War as well as being Constable of France from 1370 to his death. 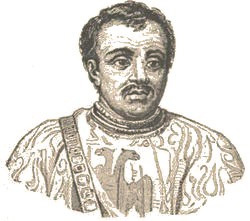 In the second half of the Hundred years War, during the 15th century, Fougères largely managed to stay out of the fighting until 1449 when the castle was taken in a surprise attack by François de Surienne (known as l'Aragonais), who was in the pay of the English. In 1488, the battle of St-Aubin-du-Cormier resulted in defeat and surrender to the Duc de la Tremoille and the subsequent defeat of Brittany by France meant that castle no longer had any military role to play. 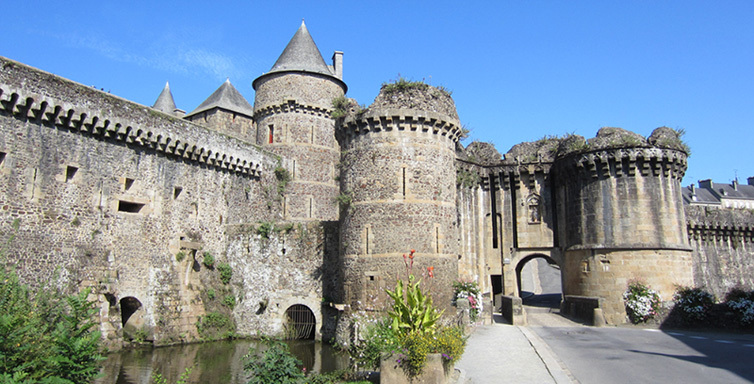 During the 17th and 18th centuries, castle became the residence of the town governor - Fougères now being a French town. The castle was left mainly in disrepair and as they were not maintained, at this time, the buildings in the outer bailey collapsed. In 1793, Fougères was caught up in the Chouannerie uprising. This was a royalist uprising in twelve of the western departements of France, particularly in the provinces of Brittany and Maine, in opposition to the French Revolution. The members of the group, known as Chouans, were motivated by their opposition to conscription and their support of the Catholic Church. They engaged in what would later be called guerrilla warfare. During the 20th century, the castle was bought by the town authorities and it is now listed as a Historical Monument.